Butterfly Threads: Craftsy Mug Rug Review and New Surprises!! Craftsy Mug Rug Review and New Surprises!! I began this series of Mug Rugs for the Craftsy blog this past year with a fun 3D flying geese block that included a partial seam technique. I decided that if we were going to make some cute mug rugs we might as well try some new techniques along the way. Use up scraps AND learn something new at the same time, double the fun! 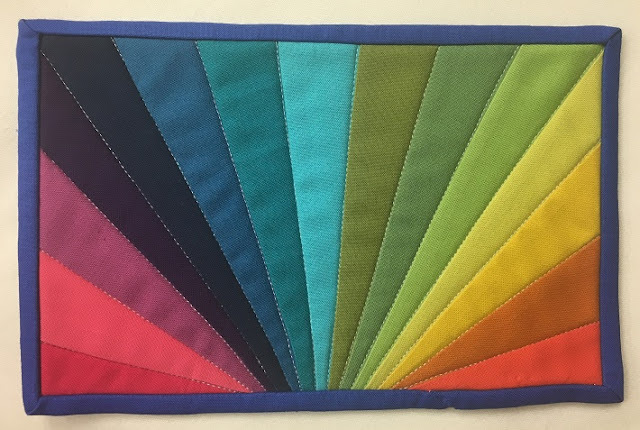 This rainbow mug rug design was a fun way to use paper foundation piecing. By doing a simple sew and flip technique with strips, this colorful mug rug came to life. I still think this would be fun to try in just a two color scheme. Anyone who knows me knows that I'll find a way to add selvages to any project or idea. I just love sewing with selvages and this little project is no exception. Simply layering them along with the batting and backing means that they are sewn and quilted all in one step! This mug rug uses a folded fabric technique that is not only fun but easy. I enjoy trying different methods for achieving good results and this one was so fun that I had to add rick rack and a decorative stitch! Talk about fast and easy. 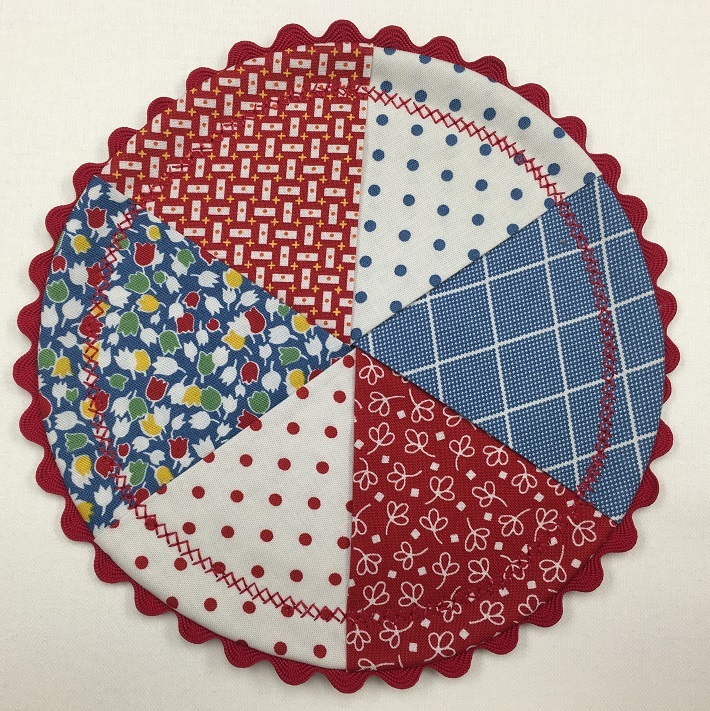 Sewing strip sets, slicing them apart and re-sewing them creates a fun checker board in a flash. This would look great with a rainbow of strips as well. Having been inspired by last year's block of the month series, this little strip pieced apple seemed unavoidable. 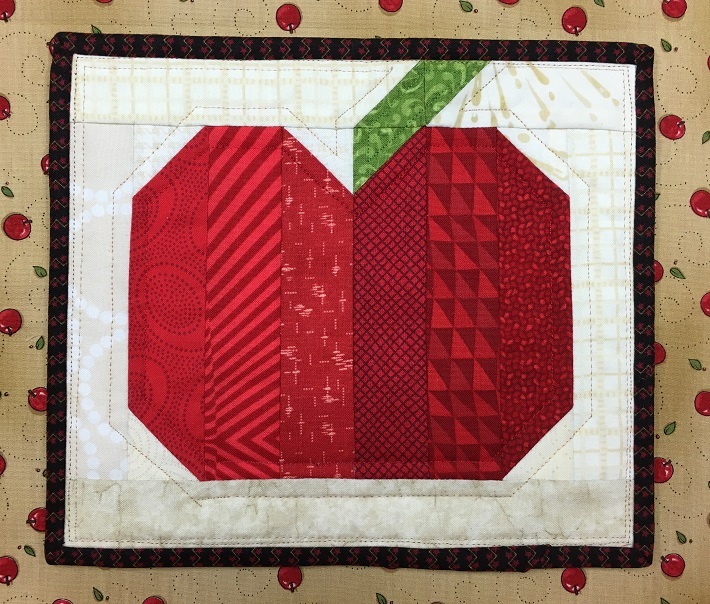 I like the result and I'm tempted to make a runner using red, green, and yellow apples. Working with triangles can be intimidating to some folks, so this easy pieced mug rug is a great place to start with triangles. 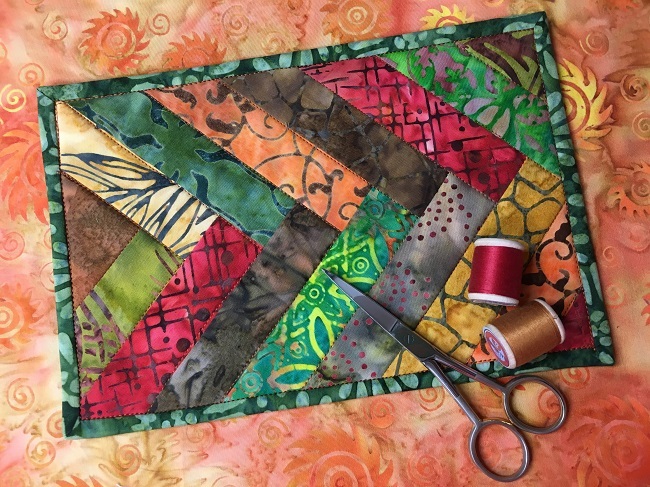 I've never made a braid quilt, but I thought that starting with a tiny sew and flip braid project might just inspire me to make a larger one. Now that I've tried it, I can see that it could be addicting. This little stack of presents is a simple pieced unit but the trim is what makes it special. 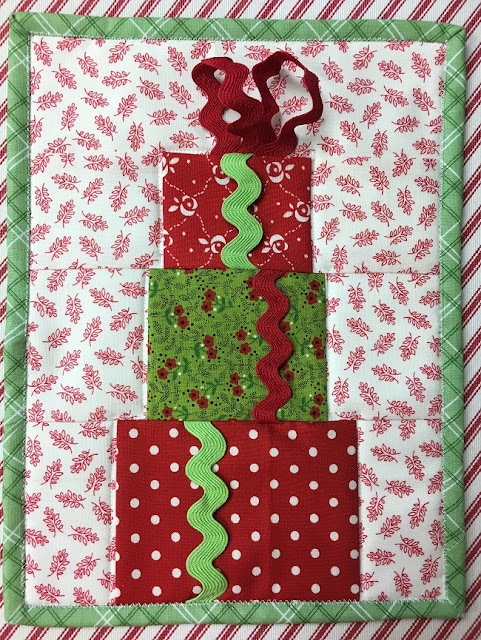 I left the rick rack unsewn so that gift cards could be inserted for a fun gift giving idea. This would be awesome for birthdays too. 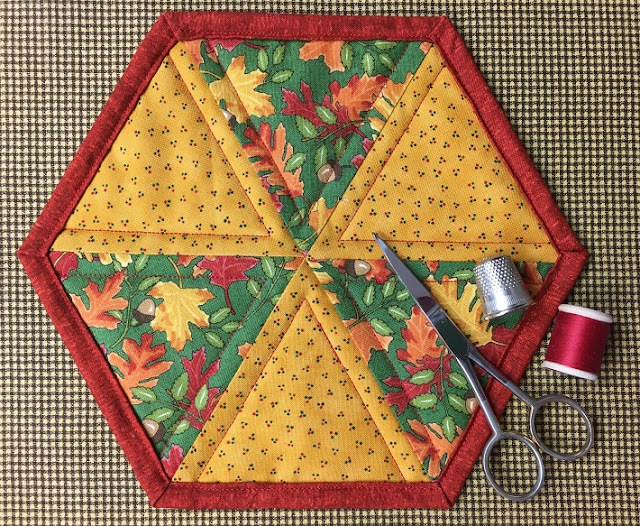 Now that we are entering a New Year, we have some new things to look forward to on the Craftsy Quilting Blog. I won't be doing a Scrappy Block of the Month, or a Mug Rug of the Month. I'll be playing with some of these amazing fabrics that Craftsy sent me. No rules this year, just fun projects from the Craftsy website, my imagination, and who knows what else! Nothing too hard, nothing too complicated, all very fun and easy with great step by step tutorials and hints and tips. Heck, it's even going to be a surprise to me as I haven't chosen the projects yet! I hope you are looking forward to these surprise projects as much as I am. Thanks for the recap of the mug rugs on Craftsy. I'm thinking of trying some of the designs as mats to put under houseplant pots. 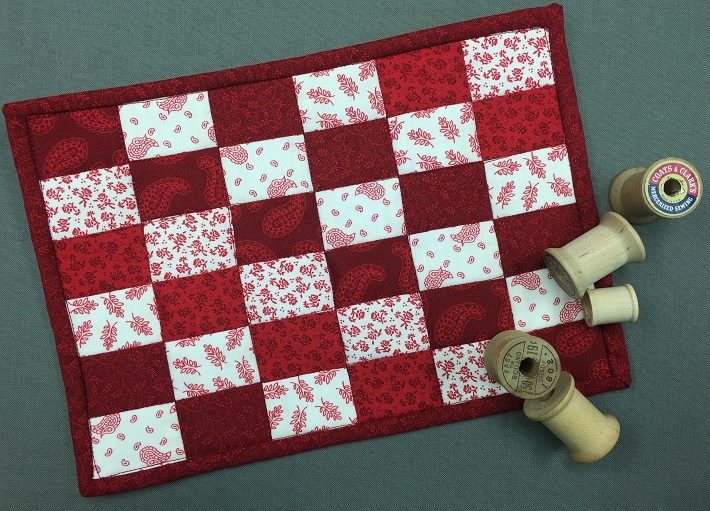 I will try the selvedge mug rug!! Your project will be beautiful, love the fabrics! fun review - have fun with your new treasures! I made your braided batik mug rug, and it was fun and quick! I have so many batik charm squares that I never use, and this was perfect for them.